diagnosis of the asthma–COPD overlap syndrome (ACOS). The latest updates to the GOLD strategy document (referred to in this article as 'the GOLD report')10 have not made any changes to the multidimensional assessment of COPD introduced in 2011 based on spirometry, symptoms, exacerbation risk, and presence of comorbidities. Spirometry, symptoms, and exacerbation risk are used to categorise patients into four groups: A, B, C, or D (see Figure 1, below) and the choice of initial pharmacological treatment is based on the group into which the patient falls. 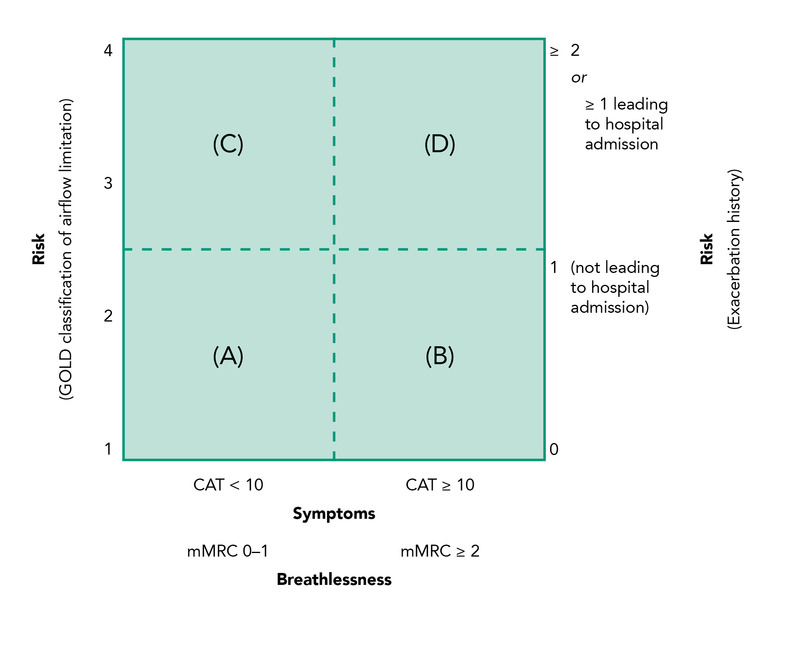 An initial assessment of a patient's symptoms should be made using the modified British Medical Research Council's questionnaire (mMRC) or the COPD Assessment Test (CAT) score. On the basis of these assessments, patients are divided into those with few symptoms and those with a high level of symptoms. one or more hospitalisations with an exacerbation in the past year. Patients can be assessed as high risk on the basis of lung function alone, exacerbations alone, or both. D: more symptoms, poor lung function. The assessments of symptoms and risk of exacerbations are used to guide pharmacotherapy. Short-acting bronchodilators can be prescribed for people with few symptoms and low risk (Group A)10 but most patients require treatment with long-acting bronchodilators, which improve symptoms and reduce exacerbation rates13,14 as well as improving lung function and exercise capacity. Long-acting antimuscarinics (LAMAs) are superior to long-acting beta agonists (LABAs) as monotherapy.10,16,17 Once-daily tiotropium, administered via a dry powder or soft mist inhaler, has been used for many years to treat COPD effectively10,18 and has an excellent safety record.19 Glycopyrronium and umeclidinium are also once-daily LAMAs and aclidinium is a twice-daily LAMA; all these drugs are administered using dry-powder inhalers.20 These newer LAMAs appear to have similar effects on lung function to tiotropium,21–23 but do not appear as effective at reducing exacerbations and do not have as extensive safety data. When withdrawing ICS, great care is needed to ensure that patients do not have asthma with fixed airflow obstruction—misdiagnosed as COPD or as part of the asthma–COPD overlap syndrome (see below). In 2015/16, both the GOLD10 and Global Initiative for Asthma (GINA)26 reports included a section discussing the differential diagnosis of COPD and asthma and the diagnosis and management of the so-called asthma–COPD overlap syndrome (ACOS). Some patients who present with chronic respiratory symptoms, particularly older patients, have diagnoses and/or features of both asthma and COPD, and are found to have airflow limitation that is not completely reversible after bronchodilatation.27–29 Some have an unequivocal history of asthma that has been poorly controlled and has resulted in fixed airflow obstruction, but which remains asthma. A small group of patients, however, have risk factors for and clinical features of both diseases and the concept of an 'overlap' syndrome has been proposed.10 These patients experience frequent exacerbations,31 have a worse quality of life, a more rapid decline in lung function, and higher mortality;28,30 they also consume considerably more healthcare resources31 than patients with either asthma or COPD alone. The true prevalence of ACOS is difficult to determine because different studies have used different diagnostic criteria. Using the loosest definition of ACOS, which includes people who do not have fully reversible airflow obstruction in the context of an obvious diagnosis of asthma, the prevalence has been stated at over 25% of people with asthma;32 in people with COPD with significant bronchodilator responses, the prevalence of ACOS in COPD has been stated to be 56%.33 With a more sensible definition, however, which includes people with clinical features of both asthma and COPD, exposure to a risk factor for COPD, and where a firm diagnosis of asthma or COPD cannot be made, the prevalence is around 10–15% of people with airways disease.34,35 Asthma–COPD overlap syndrome is thus uncommon and in the overwhelming majority of patients a definite diagnosis of either asthma or COPD can and should be made. Step 1: Does the patient have chronic airways disease? Step 5: Referral for specialised investigations (if necessary). Global Initiative for Chronic Obstructive Lung Disease. Global strategy for the diagnosis, management and prevention of chronic obstructive pulmonary disease. Updated 2016. GOLD, 2016.
identify features that make conditions such as cardiac failure more likely causes of the symptoms. Exposure to environmental hazards (e.g. occupational or domestic exposures to airborne pollutants). On the basis of the history and examination and any relevant investigations, a firm diagnosis of asthma or COPD can be made in most patients. In the small number of patients in whom this is not possible the GOLD report10 proposes considering the number of features that are helpful in distinguishing between asthma and COPD in clinical practice and counting the number that favour a diagnosis of asthma and the number that favour a diagnosis of COPD (see Table 2, below). The text states that having three or more of the features listed for either asthma or for COPD, in the absence of those for the alternative diagnosis, provides a strong likelihood of a correct diagnosis of asthma or of COPD. Rapid-acting bronchodilator treatment provides only limited relief. For a patient, count the number of check boxes in each column. If three or more boxes are checked for either asthma or COPD, the patient is likely to have that disease. If there are similar numbers of checked boxes in each column, the diagnosis of ACOS should be considered. The report also points out, however, that the absence of any of these typical features has less predictive value, and does not rule out the diagnosis of either disease. It gives the example that a history of allergies increases the likelihood that respiratory symptoms are due to asthma, but such a history is not essential for the diagnosis of asthma since non-allergic asthma is a well-recognised asthma phenotype.10 When a patient has similar numbers of features of both asthma and COPD, the diagnosis of ACOS should be considered—but it is important to realise that there is no single diagnostic test or pathognomonic features to confirm the diagnosis. If a diagnosis of asthma or COPD is made, patients should be managed according to local guidelines or to the GINA26 or GOLD10 reports. If ACOS seems to be the likely diagnosis, it is recommended that the initial treatment should be based on asthma guidelines, using low- or moderate-dose ICS and a LABA or LAMA, until the response to treatment or further investigations clarify the diagnosis. This approach recognises the pivotal role of ICS in preventing morbidity and even death in patients with uncontrolled asthma symptoms, for whom even seemingly 'mild' symptoms (compared with those of moderate or severe COPD) might indicate significant risk of a life-threatening attack.10 For this reason, LABA or LAMA monotherapy should not be used in people with ACOS. If patients have persistent symptoms and/or exacerbations despite treatment or if there are clinical features to suggest alternative diagnosis (e.g. bronchiectasis, pulmonary fibrosis, pulmonary hypertension, or cardiovascular diseases) patients should be referred for further evaluation. Patients should also be referred if they have a clear diagnosis but also have atypical or additional symptoms or signs (e.g. haemoptysis, significant weight loss, or night sweats) that suggest an additional diagnosis. The GINA–GOLD report on ACOS38 points out that our understanding of ACOS is at a very preliminary stage and most evidence about managing people with chronic airflow limitation comes from studies that have used specific entry criteria to exclude people with asthma from COPD studies, and vice versa, with the result that people with ACOS have been excluded from all studies of pharmacotherapy for chronic airway disease. There is an obvious need for more research on the management of ACOS. Further work is needed to inform the development of evidence-based diagnostic definitions, and studies are needed on people with ACOS to define optimal management. There were minor changes to the recommendations on COPD management in the 2015 and 2016 updates to the GOLD report. It continues to emphasise the importance of the multidimensional assessment of COPD, introduced in 2011, based on spirometry, symptoms, exacerbation risk, and presence of comorbidities; however, in 2015 a section discussing the differential diagnosis of COPD and asthma and the diagnosis and management of the so-called asthma–COPD overlap syndrome (ACOS) was added. Long-acting bronchodilators remain the mainstay of pharmacotherapy in COPD and although there is growing evidence about the efficacy of LABA/LAMA combinations, the place of these drugs in the management algorithm has not yet been addressed by GOLD. Inhaled corticosteroids have a limited place and the updated GOLD report states that ICS can be withdrawn, if it has been prescribed inappropriately, without increasing the medium-term risk of exacerbations. A much more extensive revision of the GOLD report is due to be published in 2017. There were minor changes to the recommendations on COPD management in the 2015 and 2016 updates to the GOLD Report. A more extensive revision of the GOLD Report will be published in 2017.
could run education events for practice nurse leads on using multidimensional assessment, which is likely to reduce inappropriate prescribing of inhaled steroids and optimise bronchodilator therapy. Halpin D. Improving the management of COPD. BMJ 2011; 342: d1674. National Collaborating Centre for Chronic Conditions. Chronic obstructive pulmonary disease. National clinical guideline for management of chronic obstructive pulmonary disease in adults in primary and secondary care. Thorax 2004; 59 (Suppl 1): 1–232. Miravitlles M, Vogelmeier C, Roche N et al. A review of national guidelines for management of COPD in Europe. Eur Respir J 2016; 47 (2): 625–637. Global Initiative for Chronic Obstructive Lung Disease website. www.goldcopd.com (accessed 16 April 2016). North East & West Devon CCG. NEW Devon Formulary. 2016. 3. Respiratory. Chronic obstructive pulmonary disease (COPD). Available at: northeast.devonformularyguidance.nhs.uk/formulary/chapters/3.-respiratory/chronic-obstructive-pulmonary-disease-copd (accessed 18 April 2016). Pauwels R, Buist A, Calverley P et al. Global strategy for the diagnosis, management, and prevention of chronic obstructive pulmonary disease. NHLBI/WHO Global Initiative for Chronic Obstructive Lung Disease (GOLD) Workshop summary. Am J Respir Crit Care Med 2001; 163 (5): 1256–1276. Vestbo J, Hurd S, Agusti A et al. Global strategy for the diagnosis, management, and prevention of chronic obstructive pulmonary disease: GOLD executive summary. Am J Respir Crit Care Med 2013; 187 (4): 347–365. Singh D. Exercise, advice, and tailored treatments are effective in COPD. Guidelines in Practice 2014; 17 (12): 22–35. Agusti A, Hurd S, Jones P et al. FAQs about the GOLD 2011 assessment proposal of COPD: a comparative analysis of four different cohorts. Eur Respir J 2013; 42 (5): 1391–1401. Kew K, Mavergames C, Walters J. Longacting beta2-agonists for chronic obstructive pulmonary disease (Review). Cochrane Database Syst Rev 2013; 10: Art no: CD010177. Halpin D, Vogelmeier C, Pieper M et al. Effect of tiotropium on COPD exacerbations: A systematic review. Respir Med 2016; 114: 1–8. Vogelmeier C, Hederer B, Glaab T et al, for the POET-COPD Investigators. Tiotropium versus salmeterol for the prevention of exacerbations of COPD. N Engl J Med 2011; 364 (12): 1093–1103. Decramer M, Chapman K, Dahl R et al. Once-daily indacaterol versus tiotropium for patients with severe chronic obstructive pulmonary disease (INVIGORATE): a randomised, blinded, parallel-group study. Lancet Respir Med 2013; 1 (7): 524–533. Tashkin DP, Celli B, Senn S, Burkhart D, Kesten S, Menjoge S, et al. A 4-year trial of tiotropium in chronic obstructive pulmonary disease. N Engl J Med 2008; 359 (15): 1543–1554. Halpin D, Dahl R, Hallmann C et al. Tiotropium HandiHaler® and Respimat® in COPD: a pooled safety analysis. Int J Chron Obstruct Pulmon Dis 2015; 10: 239–259. Jones P, Singh D, Bateman E et al. Efficacy and safety of twice-daily aclidinium bromide in COPD patients: the ATTAIN study. Eur Respir J 2012; 40 (4): 830–836. Kerwin E, Hebert J, Gallagher N et al. Efficacy and safety of NVA237 versus placebo and tiotropium in patients with COPD: the GLOW2 study. Eur Respir J 2012; 40 (5): 1106–1114. Ismaila A, Huisman E, Punekar Y, Karabis A. Comparative efficacy of long-acting muscarinic antagonist monotherapies in COPD: a systematic review and network meta-analysis. Int J Chron Obstruct Pulmon Dis 2015; 10: 2495–2517. Oba Y, Sarva S, Dias S. Efficacy and safety of long-acting β-agonist/long-acting muscarinic antagonist combinations in COPD: a network meta-analysis. Thorax 2016; 71: 15–25. Price D, Yawn B, Brusselle G, Rossi A. Riskto-benefit ratio of inhaled corticosteroids in patients with COPD. Prim Care Respir J 2013; 21 (1): 92–100. Abramson M, Schattner R, Sulaiman N et al. Accuracy of asthma and COPD diagnosis in Australian general practice: a mixed methods study. Prim Care Respir J 2012; 21 (2): 167–173. Gibson P, Simpson J. The overlap syndrome of asthma and COPD: what are its features and how important is it? Thorax 2009; 64 (8): 728–735. Marsh S, Travers J, Weatherall M et al. Proportional classifications of COPD phenotypes. Thorax 2008; 63 (9): 761–767. Kauppi P, Kupiainen H, Lindqvist A et al. Overlap syndrome of asthma and COPD predicts low quality of life. J Asthma 2011; 48 (3): 279–285. Andersén H, Lampela P, Nevanlinna A et al. High hospital burden in overlap syndrome of asthma and COPD. Clin Respir J 2013; 7: 342–346. Kiljander T, Helin T, Venho K et al. Prevalence of asthma–COPD overlap syndrome among primary care asthmatics with a smoking history: a cross-sectional study. npj Primary Care Respiratory Medicine 2015; 25: 15047 (doi:10.1038/npjpcrm.2015.47). Shirtcliffe P, Marsh S, Travers J et al. Childhood asthma and GOLD-defined chronic obstructive pulmonary disease. Intern Med J 2012; 42 (1): 83–88. Menezes A, Montes de Oca M, Pérez-Padilla R et al. Increased risk of exacerbation and hospitalization in subjects with an overlap phenotype: COPD–asthma. Chest 2014; 145 (2): 297–304. Miravitlles M, Soriano J, Ancochea J et al. Characterisation of the overlap COPD– asthma phenotype. Focus on physical activity and health status. Respir Med 2013; 107 (7): 1053–1060. Heaney L, Brightling C, Menzies-Gow A et al. Refractory asthma in the UK: cross-sectional findings from a UK multicentre registry. Thorax 2010; 65 (9): 787–794. Tashkin D, Celli B, Decramer M et al. Bronchodilator responsiveness in patients with COPD. Eur Respir J 2008; 31 (4): 742–750. This CPD activity consists of 5 multiple-choice questions designed to test your knowledge on asthma–chronic obstructive pulmonary disease (COPD) overlap syndrome—you will then be prompted to reflect on your learning.